The greatest adventure film ever made, with one of the best casts that is imaginable is the predecessor to this movie. The original Jaws is Steven Spielberg's masterpiece, everything he has done since is an attempt to reach the same heights of personal success and movie history glory. Sure he has made dozens of films since then, and won honors and accolades for most of them. There is popular and critical success in everything he does, but Jaws will be the movie he is remembered for. Jaws is the movie that scholars, critics and fans continue to write about thirty-five years after it's release. There is nothing to compare to it, which means that today's movie has an impossible task. You cannot fall in love for the first time on a second occasion. You can try to relive the moment, but it is never the same. I think Spielberg knows this and that's why he stayed away from the subsequent films in this series. Indiana Jones is a continuing story, but you can't kill Quint more than once. Everyone in 1978 was looking forward to this movie despite the lack of Mr. Spielberg at the helm. The first movie was still in everybody's head and the energy from the movie hung in the air like electricity waiting for Ben Franklin to get out his key and try to capture it. The director for this movie was a TV director who had made one feature film before this, a horror film called Bug. It is on the list for the project, although I do not have a copy of it and I am running a bit low on time, we'll see. Anyway,he made a few other features including the beloved "Somewhere in Time", but he has never had the success he would expect from this movie again. He is still directing TV programs on a regular basis. Universal seems to have gone to their bullpen for a good relief pitcher and they got a solid inning out of him. Not one that would make him a star, but one that held the lead and advanced the team to the next inning. Of course it was a no win scenario, you can't top perfection. So what is it that Jeannot Szwarc managed to produce. 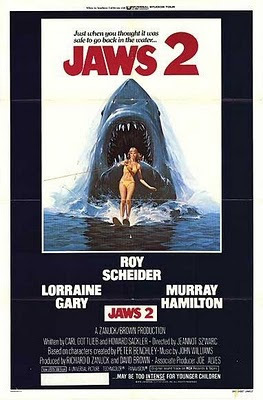 Jaws 2 is the movie that the first film would have been if two things had happened. If the mechanical shark had actually worked consistently, then we would have seen it early on and often, not just at the climax. This is what you get in Jaws 2, after the opening segment with two divers checking out the wreck of the Orca, we see the shark in every attack. Long shots, medium and close ups are used in all the subsequent attacks. Sometimes there are some good solid set ups, but they can't create the suspense that the first film was forced to improvise because of the lack of an actual shark to show. The other thing that would have made this version the original movie, would be the absence of Spielberg. The performances that he got out of the actors in the first movie, the small pieces of humor and imagination are missing here. Jaws 2 is a straightforward action thriller. There are some attempts to add drama to the mix, but they mostly lead to dead ends. For instance, the segment where Brody is fired, lasts just a couple of minutes before he is back in action, on a boat and off to save the day despite not being the Chief anymore. So what is the point of him losing his job? ; it is to fill in time until we can get back to the shark attacks. In the original, everything happens for a reason, it builds character and makes motives relevant in the final resolution of the story. In this movie, we know the characters for the most part. They are cardboard figures that exist to move us to the next action sequence, or to try and give us a reason to care about the events that are coming. It is pretty standard stuff and works fine here, but it does not elevate the film-making. We are set up for this movie with one of the greatest ad lines in the history of movies. The tagline is on a par with the tag for "Alien"..."In space, no one can hear you scream." The teaser poster for this movie put it plainly,..."Just when you thought it was safe to go back in the water." The original really did keep people out of the ocean. Amanda to this day is not a fan of the beach for this very reason. It took twenty-two years to come up with a sequel to Psycho, but no one remembers much about it, in part because the memory of being afraid to shower was lost in the intervening years. The producer's of the Jaws films, did not make that mistake. They struck while the iron was hot, and as far as the fear factor, it works pretty well. There is a great sequence in the movie where the shark is stalking a water skier. We get some good looks at the fin, and some better point of view shots from under the water. The climax of the scene works not because of the close up of the shark attack on the boat, but because of the confusion and panic of the boat driver. In a similar vein, at the end of the movie, when all the kids are stranded on the boats, it is not the horror of undetectable death that holds us, it is the wild notion of what would happen if a shark attacked a helicopter? Brody's final showdown with the shark lacks any suspense, but the execution of the idea is pretty satisfying. Thus, this movie works fine, but it is just another action film. Dolores and I saw this movie on opening day at the multiplex in the Cerritos shopping center. There was a long line and most people were anxious to know what was going to happen. I can say we were satisfied but not wowed. I thought it was a tight film that got to the action beats the audience expected without too much mucking around. I did appreciate that the kids in the picture were not overwritten. They are just teenagers, having summer fun and trying to figure their lives out. It looked at one point like a love story might be in the offing, and the Mayor's son is set up as a bit of a prick, but it never turns into a bully cliche, or a sappy romance. The Mayor's son turns out to be a pretty decent guy like all of the kids. If this movie were going to be lengthened, and you were going to attempt to add the same kinds of layers that the first movie had, the kids would have been the place to try it. I think they were smart to stay out of that pond and stick to the action. I suggest that you stay away from the other films in the series completely. Jaws 3-D was a gimmick film that suffered from the problem that most 3-D films in the 80's suffered from, not enough light. You have two or three good 3-D shots but the movie is so dark that even on shore in the sunshine it seems dim. And speaking of dim, Jaws the Revenge is just stupid. 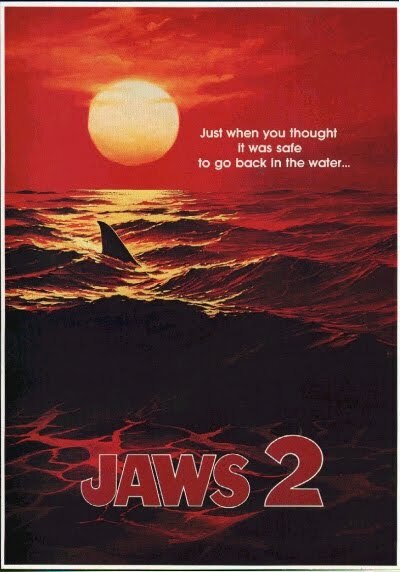 See Jaws 2 if you must, but remember, You can't fall in love for the first time again.